When planning network architecture for the next few years, I believe that it is important to comprehend that the network is just a one part of an overall system. The ITIL foolishness that drive most IT infrastructure processes prevents clear systemic thinking and I’m often having to explain how the network is fully integrated into the server and storage architecture. It is too simple to say that “everything is connected”. The real story is that the network will, over time, be orchestrated by external software applications. More correctly, everything will be orchestrated by by software. Portals and service catalogs are far more interesting than the network connectivity. I created this following block diagram to explain my current perspective. Over time, I have identified products and solutions in most of the areas, there are some places that I still don’t understand well and I’m still researching in the there areas. You can click for a much larger image which should be more readable. 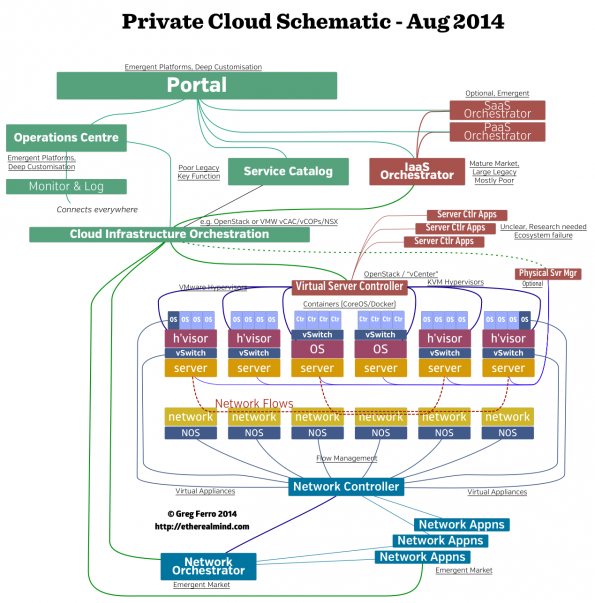 I recently did some consulting work for a public cloud company which highlighted that public clouds have basically the same technology as private clouds. There are some specific matters around scaling and simplicity because public clouds are operated differently but the actual software and hardware is often the same. Too many companies think that building a private cloud is simply upgrading their VMware vCenter to a vCloud / vCAC / vCOps solution and then learn some very harsh lessons in gap analysis and expectations. If you think this is interesting, I am available for consulting on a hourly basis and can advise you on your own private cloud.